Hi all, let me start by saying prior to today I didn’t know the bloke I speak of below so I have no vested interest but anyone who is not confident with fish finders read on as I highly recommend. Just wanted to let anyone interested know about some on water training I had in the Brisbane river today for my new Lowrance HDS 7 live. I paid what I consider a lot for this model which was an upgrade to my elite ti model. 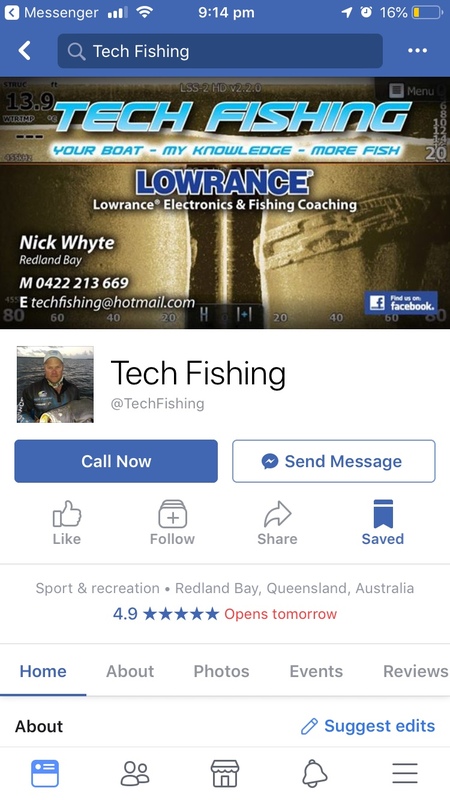 Read on the net about a bloke called Nick Whyte who is one of the Lowrance team pros and runs a business called tech fishing (check on Facebook and YouTube). I was getting pretty frustrated because I see all these pros on the net with these perfect images and I couldn’t see a damn thing. I figured I had a busted unit haha. It cost me $280 for 3 hrs (obviously it goes up from there) which I guess some people might balk at but I have to say I learnt more in 3 hrs than I have for months trying to watch YouTube videos. Great bloke with an amazing amount of knowledge. Anyway i I was pretty stoked because I went from what I would call a lowrance Gumby to having a sound understanding. Thanks for that report. Good to know the tuition was so helpful for you. There are lots of people who struggle with the new features of marine electronics, so many advances its hard to keep up, and interpretation of the downscan and sidescan images is quite different to traditional sonar. Heck, some even struggle with the basics of system settings. Let alone more advanced stuff such as networking! Unless you have someone in your circle of friends who has the knowledge and experience, a service like can be provided by one of the manufacturer’s pro-staff makes a lot of sense. I would be curious to know what you would count as the “top 3” take-aways you got out of the tuition? well we are all entitled to our own views thats called a free liberal democracy which Australia is supposed to be - the poster is a brand new poster and the "review" appears to be a pretty blatant highlighting of a $ charged for service which in my view infers a classified advertisement- but hey if you think its a useful "independent review" then thats fine (and if it turns out to be a good helpful tuition service then thats good - and then of course there is a proper place for that to be highlighted and advertised on the site - but hey its a free country !! anyway that hat was my top three off top of my head. Also to the other poster, not sure how this was a classified. It was a review only. Take it or leave it. Mate you seem to have your knickers in a knot about something. Anyway I am new to the forum. My review was about a training service for electronics namely my 2 week old HDS 7 live. I didn’t see a section entitled reviews so placed it in what seemed most appropriate being electronics. The reason I did is because I came away extremely pleased with the service and thought others may like it. I found the bloke by accident and was lucky enough to see one of his presentations at a club BCF night so I decided to take the plunge and pay the money. If you don’t like my review ignore it but I’m sure others may be interested. Anyway i didn’t pay to join this forum to waste my time explaining why I posted, I just saw some helpful things and tips I had picked up on this forum so thought I would do same. The review was perfect. I’m glad you got what you paid for and will now be confident using your device. I didn’t realise there was such a service out there. Perhaps your review will let others struggling with their devices consider spending the money to become knowledgeable. It may not be cheap, but nothing in this world is. Well done and enjoy your fishing. Seastrength, after you do the tuition let me know how you went and your thoughts on the unit. Once you actually know what your looking at they are an awesome unit. By the end I was identifying weed beds on top of mud banks. Big thing is positioning of transducer but first thing Nick will do is check that for you. I’d recommend Nick Whyte to anyone wanting to learn more about their sounder. What he can teach you in 3 hours will improve your fishing for the rest of your life. He also does fishing tuition courses and a mate from work did one and caught a 1m+ Threadie and now he regularly catches Threadies and Jew in the Brisbane river simply by using the right techniques and finding the right shows on his sounder.